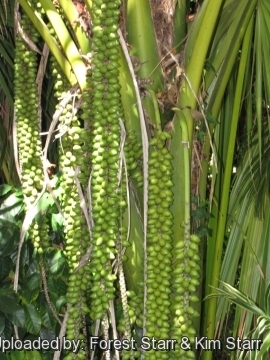 Fruiting habit at Enchanting Floral Gardens of Kula, Maui, Hawaii (USA). March 01, 2012. Origin and Habitat: Endemic to Lord Howe Island group, in the Tasman sea about 804 km off the eastern coast of New South Wales, Australia. Habitat: It grows grows in shade under higher trees and palms in the lowland and submontane moist forest of the island, between 100 and 300 m. of altitude. It is less numerous there than the sympatric Howea forsteriana, usually growing a bit higher up the hills and mountains than Howea forsteriana, in basaltic soils. The climate on Lord Howe Island is subtropical, warm to cool. A valuable ornamental, the seeds of wild trees are collected and germinated, and the seedlings are exported. The seed industry is strictly regulated. Lord Howe Island is a World Heritage Site, most of which is a permanent park reserve. Kentia belmoreana C.Moore & F.Muell. Description: Howea belmoreana is a beautiful medium sized solitary and stately palm tree. The feather-like leaves are abundant, flowing and characteristically curved (hence the common name: Curly palm). Trunk: Solitary, erect 6-10 m tall and 15 cm in diameter, bulging at the base; young stems green, turning gray with age; ring scars are prominent, raised, and undulating. No crown shaft is formed from leaf sheaths, but the leaf-bases disintegrate into a conspicuous mass of woven brown fibres. Crown: The canopy of a mature palm tree spreads anywhere from 1,5-5 m in diameter and contains roughly three dozen leaves. Leaves: Pinnate, reduplicate, 2-3 m long, with very short petiole, strongly arched. Leaflets, crowded, evenly spaced, linear, very dark green (above and below) and can look almost black from a distance, with prominent secondary veins, arranged in a single plane, adaxially angled (about 45° to the rachis) which give it an angular V-shape appearance. Petiole rather short at maturity. Inflorescence: Single up to 1 m long, drooping, unbranched, with simple flowers that extend off the palm like long, thick cords. It is a monoecious species, pale brown staminate (male) and whitish-green pistillate (female) flowers are produced on the same inflorescences, they are star-shaped and appear in summer. Fruit: Few broadly ellipsoidal up to 4-5 cm long and red or reddish-brown when ripe. Its seeds take 2 years to fully ripen. 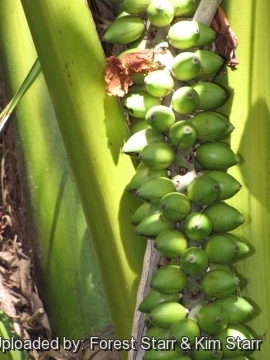 Remarks: Howea belmoreana is similar to the much more common kentia palm Howea forsteriana which is much larger at maturity and has drooping leaflets and multiple inflorescence spikes from a single leaf axis, to the contrary Howea belmoreana has more upright and recurved leaves. It also grows more slowly and is somewhat more tender to cold. It and Howea forsteriana probably evolved from a common ancestor through sympatric speciation. 1) Forest & Kim Starr Howea belmoreana (Curly palm, Kentia palm, Belmore sentry palm). Plants of Hawaii. <http://www.starrenvironmental.com>. Downloaded on 21 August 2014. 2) Johnson, D. 1998. "Howea belmoreana." The IUCN Red List of Threatened Species. Version 2014.2. <www.iucnredlist.org>. Downloaded on 29 August 2014. 5) Wikipedia contributors. "Howea belmoreana" Wikipedia, The Free Encyclopedia. Wikipedia, The Free Encyclopedia, 21 Aug. 2014. Web. 28 Aug. 2014. 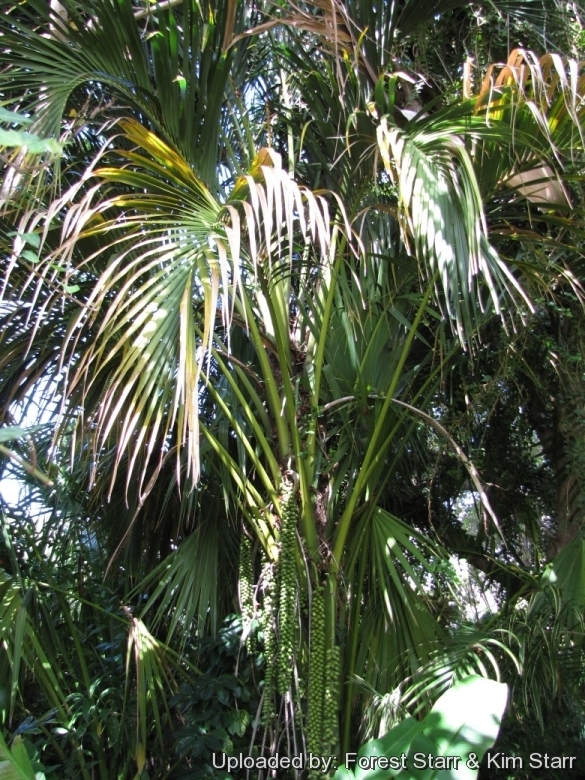 Cultivation and Propagation: This palm is an excellent but slow-growing garden plant adapt to different climates, from tropical to warm temperate. In cultivation, it also tolerates Mediterranean climates with a long dry summer surprisingly well. It is also one of the most elegant of all indoor palms, and it will thrive in positions from very low light indoors through to full sun, dust, central heating, rough handling, drought and general neglect. However it declines more speedily when grown as a pot plant than Howea forsteriana is. It also grows comparatively slowly. For all these reasons, Howea forsteriana is preferred in interior decoration. Soil requirements: It prefers well-drained fertile, soils except those that are constantly soggy. However it is widely adaptable including those that are neutral, acidic, clayey and slightly alkaline. Watering: It prefers regular waterings and should be watered before the soil completely dries. This palm a will tolerate occasional dryness if not prolonged. Don't let sit in water. Indoor, potted speciemns should not be over-watered. They may contract the fungus Phytophthora, if over-watered. Light: Outside they grow best in half sun and tolerating direct sun only after about five years old. Young specimens need protection from direct sunlight and grow best in shady to partly shady locations. If home-grown, they look their best in bright diffuse light but tolerate very low light levels and are considered exceptional in their ability to withstand low interior light levels. Aerosol salt tolerance: They grow well in coastal areas and are quite wind resistant. Wind hardiness: It can tolerate sweltering heat and windy conditions. Use: It is grown in open air, in the sub tropical and warm-temperate zones, for the decoration of parks and gardens, in a partly shaded location when young, and regularly watered. But the most frequent utilization, since from the introduction in Europe, is as indoor plant, its elegance, since the very first years of age, the adaptability to conditions of scarce luminosity, and the absence of particular attentions, render it, still now, one of the most utilized palms, if not the most common, for the decoration of indoor spaces. Disease & Pests: It is quite resistant to pests but may be susceptible to rot, mites and mealy bug. Protect from frost. Propagation: by seeds that germinate erratically, with seedlings appearing as early as 80 days after planting and then sporadically over 1-3 years.